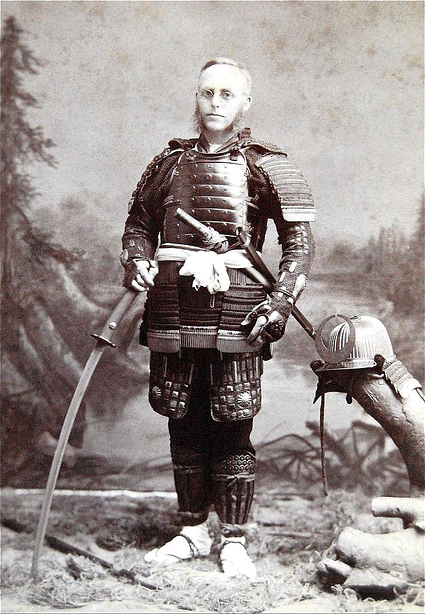 A tourist posing with Japanese weapons, circa 1890. Bedloe notes that this was the “golden age” of oriental arms collecting as the markets were glutted with high quality pieces. Photographer unknown. I am interested in the martial arts history of Fujian province. Many areas of China can rightly claim an illustrious past when it comes to producing famous boxers, military officers or performers. Shandong and Henan are often noted as centers of martial excellence. Yet coastal Fujian has its own, slightly different, claim to fame. It has long been a melting pot where martial artists from across Asia have come to trade both physical weapons and fighting styles. This global marketplace has been in business from the Ming dynasty through the present day. The history of this region is an under-appreciated chapter that touches on the development of the martial arts in many parts of Asia. Trade and fishing have been central industries for the inhabitants of the coastal regions of South East China. Merchants from these areas routinely traded between Vietnam in the South and Beijing in the North. They might travel as far west as Manila, Taiwan and even Okinawa. Chinese diaspora communities in South East Asia often have roots in Fujian, and when students from that region return to the “home country” they bring the subtle flavors of Vietnam, Malaysia, Indonesia and the Philippines with them. It is probably no surprise that the region developed a reputation for martial excellence. A heady mixture of traveling merchants, pirates and martial artists will do that. The incomparable (and largely mythic) “Southern Shaolin Temple” is usually said to have been located in Fujian. From the 1400s-1800s Japanese Samurai would try to join trade delegations (or even travel to Okinawa) so that they could journey to coastal Fujian in the hopes of learning Chinese pole and spear fighting techniques. As the spear replaced the sword as the critical weapon on the Japanese battlefield, these skills were highly sought-after and often richly rewarded. For their part, the merchants of Xiamen imported thousands of finely made Japanese swords that were highly sought after by rich officials and scholar-martial artists around the empire. This Fujianese based trade in martial artifacts and knowledge has had an important effect on the development of the martial arts around the region, often in ways that are not fully realized or acknowledged. While we all accept that Karate owes a great debt to the White Crane schools of the region, few of us usually consider the importance of the area’s pole fighting traditions, or its impact on the martial arts in the diaspora communities of South East Asia. The following discussion offers an in-depth examination of the market for antique arms that existed in the city of Xiamen (Amoy) during the late 19th century. It is the third installment in our occasional series looking at foreign languages resources on the development of Chinese martial culture. Both the first and second installments of this series were also focused on the development of economic markets in martial knowledge in southern China. The authors of those works discussed the production of written texts, including printed and illustrated martial arts manuals, in Guangzhou and Hong Kong during the 1830s and 1870. Today’s reading turns its attention to developments in the late 19th century market for antique and vintage weapons. Xiamen’s location on the regional trade routes and long association with the Chinese martial arts meant that it became a hub in the distribution and sale of all sorts of modern and antique arms. Not only were Chinese swords seen in abundance, but Japanese arms and armor, and even Korean blades, were available in its markets and through the backrooms of local brokers who specialized in the trade. The author of the current account paints a fascinating picture of a market in transition. His observations seem to indicate that in the last few decades of the 19th century the bottom fell out of the local trade in antique arms. Martial arts continued to be popular in the region, but antique arms collecting was a hobby for elites. The few elites who were interested in these topics in the 1880s and 1890s were increasingly turning their backs on traditional modes of fighting as they pursued military modernization and westernization. As this generational shift took full effect in the 1890s and 1900s, old family collections of arms were broken up and dumped on the local market, glutting it and driving the prices of these artifacts to record lows. This sudden drop in the price of art swords is an important data-point to consider. Generally speaking, the 1890s seems to be a time of renewed interest in the martial arts. A lot of teaching and innovation is happening in these years, just prior to the disastrous Boxer Uprising. But this renaissance appears to be a highly class stratified phenomenon. The gentry class individuals who may have helped to sponsor or shape this enthusiasm in a previous era were now committed to a course of modernization and westernization that would take them ever further away from the traditional arts. This split helped to widen the already growing divide between the martial arts community and the national military. That division would become permanent when the national military exams were abolished in the coming decade. No longer would most martial artists be able to look to a career in the military, or getting a job as a “military trainer,” as a path to promotion and notice. While traumatic at the time, this division turned out to be somewhat fortuitous as it allowed the martial arts to more fully enter and reconcile themselves with China’s emerging civil society. Embedded in the economic markets and social discourse of the 1920s and 1930s, the martial arts were free to transform themselves into more durable and relevant forms. 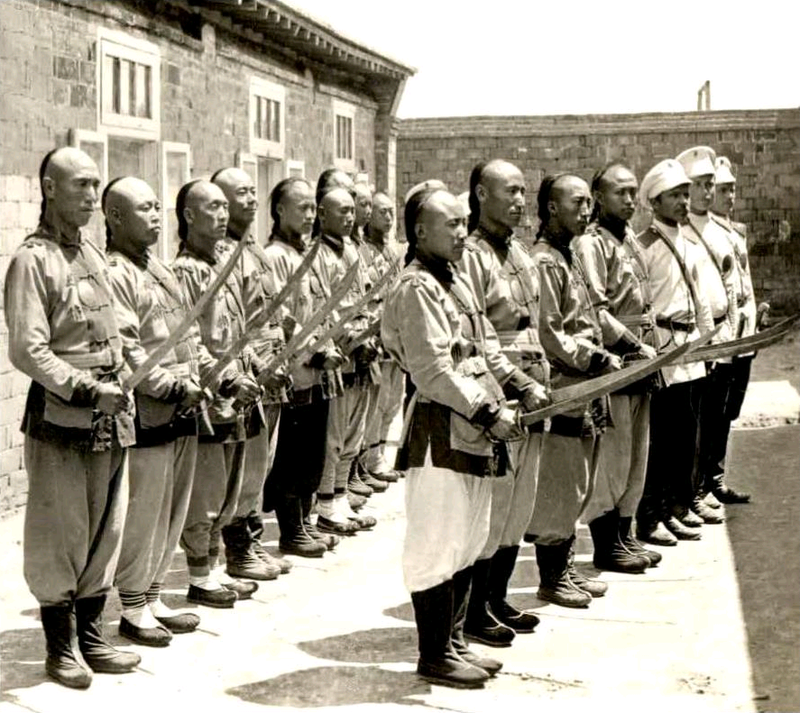 Chinese police officers employed by the Russians, probably in Port Arthur. Circa 1900. Note the modern, western style swords, that have been issued to this unit. The transition to western arms was almost complete by 1890. Source: Image taken from a vintage stereoscope slide. Before we go any further with this discussion it is necessary to examine the author of the account. Dr. Edward Bedloe was the US Consul in Xiamen from 1890-93. This was a fairly important posting. Amoy had the second largest American consulate in China after Shanghai. There was a triangular trade that happened between Manila, Fujian and the US that was becoming increasingly economically important. The Chinese merchants who carried out most of this trade were from Xiamen and so the US government began to take a keen interest in the region’s affairs. Bedloe himself is an important figure, but I cannot find anything like a comprehensive biography of him. He was born in Pennsylvania in 1848. His educational interests tended toward the medical. He graduated from Jefferson Medical College in the class of 1869 and then from the Pennsylvania College of Dental Surgery in 1870. I cannot find any evidence that he ever practiced medicine. Rather he entered the diplomatic service after graduation. His early postings were in Italy and Egypt (Alexandria). In the early 1880s he was back in Philadelphia and he was a founding member of the Clover Club in 1881. Bedloe received his first posting as a full Consul in 1890 when he was assigned to Xiamen. He stayed there for three years (until 1893). He was later reassigned as the Consul to Guangzhou in 1897 and stayed in that office until he left in a cloud of scandal in 1899. It would appear that at least some of his interests in weapons were not totally academic in nature. Working in conjunction with the Consul of Hong Kong, Bedloe granted registry to a small steam freighter named the Abbey in 1898. Registering ships under the American flag so they could conduct trade in certain ports was part of the normal function of a Consular office at that point in time. The catch was that the Abbey was known to be carrying modern arms. These were headed for Filipino revolutionaries who were then in a tacit alliance with the US during our mutual conflict with the Spanish government in the region. The unspoken implication of the Abbey’s mission seems to be that the US government was either brokering or facilitating arms transfers to anti-Spanish revolutionary groups in the Philippines. However, the Abbey was delayed on her mission and by the time she off-loaded her weapons the tactical situation had changed rather dramatically. America was now involved in a deadly conflict with those same Filipino revolutionaries. Facilitating a shipment of arms to an anti-American group proved to be a very bad career move for Bedloe. In 1899 he was suspended from the Foreign Service and recalled to Washington. It would appear that he became the fall guy for the Abbey incident, though mid-level State Department functionaries made statements to the press that the two events were not related. It seems unlikely that most members of the press believed them, and Bedloe hired a lawyer to publicly explain his position for him. It does not appear that he was ever publicly sanctioned or charged with any wrongdoing, but his diplomatic career was destroyed. He returned to his native Philadelphia and makes a number of other appearances in professional directories and local newspapers before dying in the Samaritian Hospital (a facility for the care of the indigent) on July 24, 1915, at the age of 67. These sadder chapters are still in the distant future when Bedloe wrote the article bellow. US Consuls were responsible for writing brief abstracts on a variety of topics for regular publication. In the case of Xiamen many of these are related to trade conditions and were explicitly geared to try and promote trade. The following essay actually falls into that camp. In it Bedloe attempts to both describe and promote a more robust consumer trade in a number of different types of arts and curious that can be exported from China. The entire essay is of great interest to those interested in the fine arts, but for our current purposes I have copied only the section dealing the market for antique arms and armor. Bedloe wanted his writing to be entertaining and in large measure he succeeded. Parts of this essay were even reprinted in various newspapers around the country in 1893. As a result some aspects of his writing include slight exaggerations and indulgences that need to be taken with a grain of salt. Bedloe also notes that even in the 1890s, the Chinese arms market was full of cheap knock-offs. Local officials who were too stingy to supply their retinues with actual antique arms might instead buy cast-iron replicas that looked the part but had no military value. Within the category of authentic arms there were also many levels of workmanship. Some weapons were so poorly made that Bedloe treats them with derision, where as other are so sublime that he suddenly finds himself at a loss for words. Of course one could say all of the same things about the Chinese antique market today. It does seem that the more things change, the more they stay the same. I have copied out the text of Bedloe’s discussion bellow. In general I have left the grammar and spelling as it existed in the original, but I have added some additional paragraph breaks to make the document easier to read. In a few places I have also added my own clarifying comments in brackets. 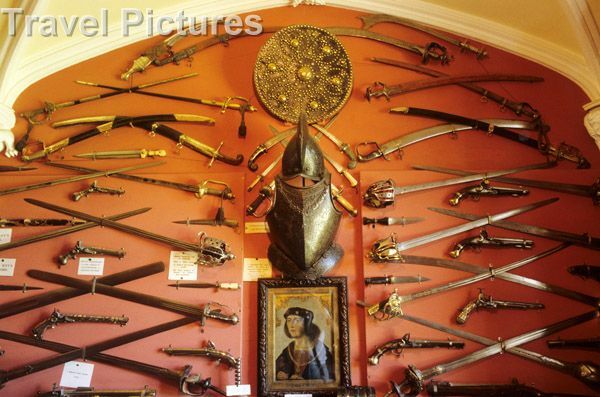 Sir Walter Scott’s important collection of Asian Arms at his house Abbotsford. Collections such as this were accumulated by individuals of means throughout the 19th century. Note the 18th century Jian hanging high on the left-hand wall. This is probably one of the earliest provenanced swords of this type in the UK. Source: image courtesy Abbatsford webpage. Arms and Armor of Xiamen, 1892. Consular Reports on Commerce, Manufacturing, Ect. No. 147. December, 1892. US Congress: Washington DC. Report by Consul Bedloe, of Amoy. Few collectors in the United States are aware of the wealth of China in all sorts of oddities and curios. There is an army of connoisseurs among the rich Mongolians, but they display little or no energy is accumulating art treasures. If they see something that strikes their fancy and they are satisfied with the price, they take it without a murmur. If it be 10 cents beyond what they regard as a fair limit, they walk off in high dudgeon. As a consequence, the curio market has few ups and downs. Nevertheless, it does an immense business the year through. The best patrons are naturally wealthy natives. Then come some European collectors and experts. Ship captains and missionaries are also buyers of considerable importance. Last and least are the collectors of the United States. There is hardly an artistic taste but can be gratified in the Flowery Kingdom. A full description of the art treasures to be seen in its great cities would fill many volumes. A resume may be of interest to both the collector and the reading public. Of the former there are 1,100 types and 1,200 of the latter. The best workmanship in this line comes from Japan, and some admirable pieces are said to be of Korean origin. The Chinese work is extremely variable in quality and character, also in price, and, strange to say, the oldest and rarest weapons are sold at prices much below the charges for more modern and less curious implements of warfare. In offensive weapons there is remarkable variety. On the coast its soldiers are armed with the latest rifles, while in the far interior they employ the same arms as were used by the vast hosts of Tamerlane and Zenghis Khan. Taking the empire as a whole, the student or collector can find in use today every weapon that has been employed within its borders since the time of Confucius. In addition to this, the mandarins and high officials arm their retinues with conventional weapons representing different periods in the history of the nation. On account of the changes wrought by time, many of these martial instruments are so incongruous as to be positively funny. This, for example, the Mongolian Tartars did their fighting on horseback, and one of their most formidable arms was a pole to which was attached a hook edged on the inside like a reaper’s sickle. With this they would pull a rider from his steed, wounding or killing him in the action, or would hamstring the horse at a single stroke. This pole hook is no longer used by the few cavalry squadrons of China, but is found carried by footmen in nearly all the retinues of great nobles. It looks formidable, but when used by infantry against infantry would be as serviceable as an Indian club fastened securely to the end of a broomstick. A glance at a collection of these arms shows that military uniformity was almost unknown to the Chinese generals of the past, and that the armies were up of divers elements, armed usually with such implements used in peaceful pursuits as could be used in war. A common weapon is a trident, tined and barbed exactly as those employed by fishermen in spearing eels. Similar to this is a three-prong hay fork. Of equally bucolic origin is a long pole to whose end is fastened the end of a scythe or sickle. The European mace is suggested by a long handled, light-headed hammer similar to that with which Charles Martel is said to have won his quaint name. It is obvious that these weapons were of harmless origin. The first was the favorite instrument of fishermen and the second, third and fourth of agricultural people. Of halberds there is great variety, ranging from simple lochaber ax and poleax to the cumbrous and complicated masses of metal that were so common at the close of the age of chivalry. The oddest specimen was one which, instead of an ax blade on one side, had what appeared to be a hammerhead. It would make a serviceable implement for driving picture nails in walls near the ceiling. In archery the Chinese have long been experts, especially those of Manchooria and Se-Chuen. Their bows are of three types: the long bow, which is over 5 feet in length; the short bow, which is about 4 feet long; and the crossbow. The strings are made of silk, of gut, or of very strong homemade twine wrapped with fine silk in the middle. Bows are graded according to their pull, the standard being 100 catties (about 135 pounds). To determine the pull the bow properly strung is suspended from the middle and weights hung to the middle of the string until the latter is nearly an arrow’s length from the bow. Famous bowmen use bows with heavier pulls, ranging from 150 to 200 pounds, and one distinguished Robin Hood is said to have drawn a 200-catty bow (about 270 pounds). The bows vary greatly in materials, construction, decoration, and finish. They are made of one or several pieces of wood and are frequently inlaid or engraved until they are true works of art. Worthy of mention are the tiger bows. These are extra large and heavy and are generally fastened to a framework near a path or road frequented by tigers or other large animals. It requires two men to set them, and they are so arranged that the moving of a cord stretched across the road disengages the bowstring and sends the arrow on its way. The force is so great that the shaft frequently comes out of the other side of the tiger, deer, or buffalo. To insure success the arrow is usually double barbed and envenomed. On the mainland, opposite the island of Amoy, these tiger bows are in constant use and annually kill at least 50 of these big beasts. The weapons named are much cheaper than corresponding ones in the United States and Europe. The cheapest spears and halberds bring about 40 cents and bows 25 cents. From these figures the prices run slowly upward. A handsome poleax is easily had for $1, while weapons of the highest artistic value and finish can be secured for less than $5 each. A handsome stand of arms, containing poleaxes, spears, halberds, swords and daggers—two each—can be procured for about $25. A stand equally attractive in appearance, but made in imitation materials, can be had for about half that amount. Volkerkunde by F.Ratzel.Printed in Germany,1890. 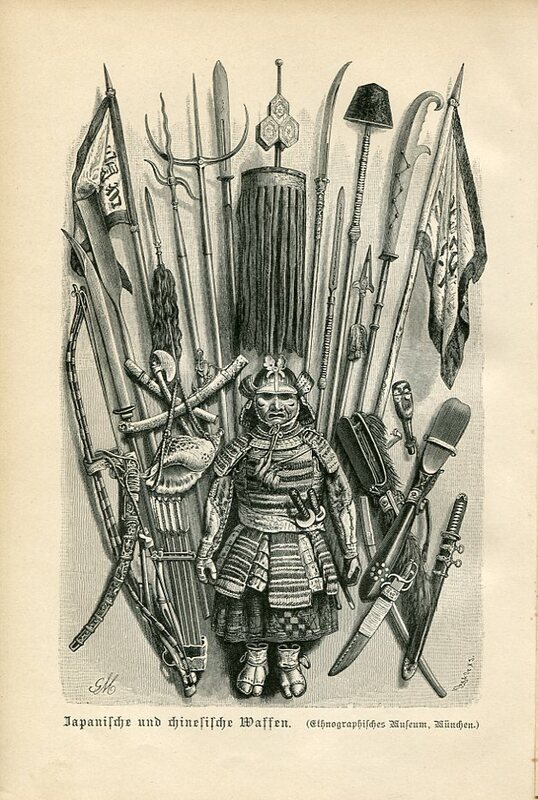 This 19th century illustration shows a number of interesting Japanese and Chinese arms including hudiedao. Bedloe indicates that this sort of a collection could have been bought in Xiamen in 1892 for less than $50 USD. An American resident in Amoy was requested to execute a commission for a distinguished divine of the United States, a gentleman who, though a man of peace, has the finest, if not one of the best, collections of swords and other deadly weapons in the world. This led to the examination of several hundred rare and curious weapons sent him for inspection and approval. No two were alike of the lot selected, and not one that did not display rare skill on the part of the Chinese sword smith. The handsomest of all is a general’s saber about 4 ½ feet long, slightly Japanese in style, with an edge like a razor and a point that would extort admiration from an Italian bandit. Unlike our own, the thickest part of the blade is the center. This gives great weight to the weapon, joined with an appearance of great lightness. The scabbard is made of hard, tough wood, lacquered to represent black iron incrusted with mother-of-pearl. The hilt is of black iron molded in form of a full-blown rose, the petals of which have been drilled with small holes and these filled with bright brass bars. The most curious of the lot is the so-called warrior’s two-bladed sword, from Ho-Nan. It is only about 2 feet long, and in the scabbard looks very like the sword bayonet from our own army. The Scabbard is plain, but very neat, and covered with white shagreen (or shark skin) and trimmed with brass mountings. When you draw it the blade divides into two, each a facsimile of the other, double edged and spear pointed. The twin blades have a remarkable decoration made by drilling seven holes about an inch and a half in diameter and put in a zigzag line from hilt to point. These are filled with pure copper, which is ground down to form a smooth surface flush with the steel and polished to a mirror-like brightness. These seven stars, as they are called, are found in nearly all martial weapons of Ho-Nan and are relics of the old astrological faith that still prevails in many parts of China. Its hold is so strong that if the copper falls out of one of the sword hole it is accepted as a sure precursor of death, and the luckless wielder of the blade usually commits suicide to escape further trouble. The short stabbing daggers, which find favor chiefly with pirates and revolutionists, form a strong contrast to with the weapons described. They are generally so ugly that they would be ludicrous were it not for the purposes to which they are applied. I have one which looks like a queerly made ace of spades fastened into a wire-bound handle. To increase the artistic effect of the weapon, the armorer has hollowed out a shallow, spoon-shaped concave on either side of the blade and filled it with blood-red lacquer, the effect of which, when suddenly drawn from a black sheath, is very startling. Spades are not the only suit in the pack that is popular in the Mongolian mind. I have another weapon whose blade is a perfect ace of Diamonds. All four sides are ground down to an almost concave edge, and the blade is made hideous by Chinese red lacquer work made to represent drops of blood and gouts of gore. Still another dagger is about the clumsiest affair of the kind I ever handled. The blade is foot long, about 3 inches wide, and half an inch thick. With its heavy brass hilt and gigantic guard it weighs over three pounds. If set with a long handle it can be used as an ax [Note: he may be describing a single “hudiedao shaped” short-sword with a brass hand guard. These are often carried and used with a rattan shield.] It is used chiefly by the Black Flags and other celestial outlaws, who, in addition to using it in the ordinary manner, throw it with fatal precision. The ex-resident of Tonquin told me that during the late war he had known instances in which knives were thrown with such force that they would go through a man’s body and show 2 inches of bloody steel beyond his back. The handles of many of the instruments of death are finished with what we call pistol grips. The most dreadful looking weapon of all is the executioner’s sword, used by the late headsman of Amoy. It is of Manchoorian type, being long, almost straight, very heavy, and keenly edged. It is used with one hand, and is shaped and wound so as to give the executioner a powerful hold upon his weapon. Upon the blade near the hilt are Chinese characters recording the tragic events in which it has taken active part. My interpreter told me that it records no less than one hundred and ninety-three human lives which it has taken out of this world. This record enhances its value. A new sword of the same kind could be bought for $10 or $12, but for this sword, with its ghastly history, the thrifty broker wanted $200 cash. He evidently thought that, although it came high, I must have it and accordingly raised the price. He was a very heart broken creature when I declined it with thanks. A word of caution as to these Oriental swords and daggers: Very many of them are poisoned, so that a mere scratch will cause death. The venom is produced by steeping the blade in decayed human blood, and is one of the deadliest known to physiological science. 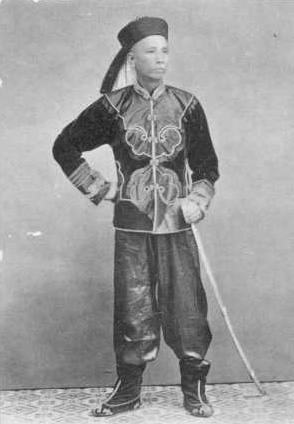 Another Qing military officer armed with a western style saber, circa 1900. From now on for the next five years will be the golden opportunity for the collector to secure the finest specimens of swords. The market has never before contained and never will again such an assortment as regards either beauty, economy, historic value, variety, or workmanship. The reasons are simple enough. The opening of China and Japan to the outside world and the introduction of firearms was a fatal blow to the sword smiths’ industry. Before that event the makers of swords formed the wealthiest and most powerful guild in the East. The medieval rivalry between Milan, Toledo, and Damascus was insignificant alongside of that of the great armorers of the Orient. Competition caused experiments in metallurgy, alloying, forging, and tempering that produced results of high value and disclosed mechanical secrets to the workers in steel that are unknown to the best cutlers in Europe and America today. They produce blades with perceptible tints in violet, blue, green, red, silver and gold. Saladin’s sword that would cut a veil or a cushion and Richard Coeur de Lion’s, which would sever a steel mace, could have been duplicated in a hundred shops in the days of the Shogunate and the eighteenth-century mandarins. Upon the sword, art ran mad. The smiths learned to arrange the fibers of the metal so as to form geometrical patterns, the figures of flowers, fruits, and leaves, and even the Chinese characters composing quotations from the great poets and philosophers. Their skills in this field bordered on the marvelous. You can obtain superb weapons even now which in the brightest sun seem made from metal mirrors. Put them in the sunlight so as to cast a reflection on a dark surface, and in the illumination you will see in faint lines every pattern I describe. The effect is the same as that produced by the magic mirrors of Japan, but how its done no one knows. The appearance of this flood of weapons upon the market is due to an additional cause. Under the ancient regime every noble, high and low, in Japan was attended by two-sworded men at arms, just as the robber barons of the middle ages were accompanied by steel clad swash-bucklers. In 1860 there were, it is estimated, at least 400,000 “two-sworders” in Japan. The revolution of 1868 changed all this in a twinkling. Sword-wearing, except by the police and soldiery, who had ordinary European weapons, was made a crime. The two-sworder lost his occupation, and his tools of trade locked up as mementos of the golden past. But twenty years have come and gone since then, the Mikadate is an established fact, and all hopes and desires of a return to the old feudal system have become mere echoes. A new generation has arisen which cares for money and not for the “hero’s weapon,” and the old one, which loved the blade for its past, is rapidly dying out. The consequences is that young Japan, with admirable thrift, is putting the weapons of his sires and grandsires in the curio shops to exchange them for yen and sen, the dollars and cents of their mint. In China the mandarin has sold his grandsire’s blade and carries an umbrella instead. So many have taken this course that the market is more than glutted. Two-thirds of these weapons have tasted blood. All are interesting, a majority are very handsome, while a few hundred are simply superb works of art. The prices at times are so low as to be laughable; $3, $2, $1.50, $1 and even 75 or 50 cents will procure a weapon such as a Broadway and Strand dealers have frequently sold for $50 and upwards. The low prices have put many noble weapons to ignominious uses. Here and there in rich farming land the Orient goes beyond the Biblical prediction and turns the sword into a plowshare, a reaping hook, a pruning knife, a carver, a poker, and even a skewer. One day I saw two fishes being roasted on a blade that may have swung in the great wars between China and Japan. There is no more handsome ornament to a drawing-room or library than a trophy of arms, and of these the most attractive is a set of eastern swords, with their exquisitely carved hilts, their noble blades, and their fantastic yet ever beautiful scabbards. Some of the arms displayed in the Library of Sir Walter Scott’s home. While China cannot compare with Europe in the beauty, richness, or variety of the defensive armor, it nevertheless can show many ingenious and interesting types. The original armor of the north (Manchooria and Mongolia) seems to have been leather, and in shape was more like a blouse than a jerkin. In the course of years the skin was doubled, trebled, and quadrupled, and a Chinese lower garment that might be called leather greaves and cuirasses combined was added to the upper one. The Mongolian Nomads learned at an early age that a coat or cuirass made of sheepskin in several thicknesses made a very warm garment and would turn a spear, arrow, or sword. Apparel of this class is in use to-day and may be bought very cheaply in Sha-Toong. Parallel to this alternating leather and wool in the north was that of paper and cotton cloth in the south of China. It seems ridiculous to call such combinations armor, and yet they made an armor superior in many instances to steel. Thirty thicknesses of alternate calico and paper will resist a pistol bullet or one from a rifle at a distance of 100 yards. A spear-man who thrusts his weapon into a man clad in this kind of garment can neither wound his enemy nor extract his weapon, and, if the enemy is an archer or is armed with a long sword, he is likely to lose his life for his mischance. The suit of the famous Yun-Nan bandit consisted of sixty thicknesses of cotton cloth and paper and made him practically invulnerable. These suits are comparatively light, are very durable, and, of course, extremely cheap. Between these extreme types lie many kinds of plate, scale, and chain armor. Plate mail never reached a high development in the far East. I cannot find that it ever passed beyond the combination of breastplate, backplate, and shoulder pieces. Scale mail, on the other hand, at an early period was carried to a high perfection. The scales were applied to cloth or leather at first as spangles are to gauze and later as tiles or slates are to the boards of a roof. They were composed of iron, pewter, silver, gold, or of various Oriental alloys. In making a suit scales of one kind were usually employed, but combinations were frequent in which metals of contrasting colors were used. A good suit of armor can be bought at prices ranging from $10 to $15. Of the different pieces of armor the helmet alone deserves attention. The Chinese artists worked along a different channel from his European colleagues and tried to make the headpieces monstrous and terrifying rather than protective. Designs representing the jaws of serpents, griffins, and dragons are very common, but such affairs as the barred visor and vizored helmet which Dore loved to draw are entirely unknown. Morions and skullcaps were also in general use and are to-day. The queerest type of all is the executioner’s helmet. It resembles a high mouse trap or flytrap in wire and painted the conventional vermilion. Centuries ago the wires were flat and so arranged as to defy swords and ax, and, owing to their great height, disconcerted the archers of the opposing army. In the north, where wood is scarce, the helmet is made from woolen cloth, leather and metal; in the west, where there are forests, wood was frequently employed; while in the south, in addition to these materials, cotton cloth and paper were also used. Helmets very in cost according to workmanship and materials, ranging from 50 cents to $50. Shields and bucklers have been in vogue from time immemorial. The favorite type is a bossed circle from 2 to three 3 feet in diameter similar to those employed by the Highlander. Its composition is leather, metal, or woven split bamboo. Bamboo shields are very strong and durable. They are made of a certain variety of that vegetable, which must have attained a certain size and hardness of the fiber before it was fit for this particular purpose. The bamboo is split into piece an inch in width and 4 feet in length, softened and braided in basketwork over a frame the size of the desired shield. It is dried in the sun and then in a kiln and afterwards polished and varnished. Its great strength and elasticity and lightness rendered it an admirable weapon of defense. A double thickness of bamboo with a metal rim makes a buckler unlike any to be found elsewhere, and costs 50 cents. Unlike at home, the new weapon costs more than the old. Antiquities can be had for a third or a fourth of the cost of new reproductions. Rich men in China prefer cheap imitations to origins, whether new or old, and the curio market scarcely known armor as an object of virtu.